The SamKnows products and services are often used by ISPs to meet regulation. Sometimes we create tailor-made products to solve particularly complex regulatory or advertising requirements. A ready-made set of metrics to comply with Ofcom's Voluntary Code of Practice. Metrics to measure the Australian Competition and Consumer Commission typical busy period speeds. A wireless network monitoring kit to help ISPs and regulators comply with the FCC’s Mobility Fund II project. The Ofcom Voluntary Code of Practice is very important within the UK Broadband market and as an ISP, whether you are a signatory or not, you are probably affected by it and looking to measure your data. 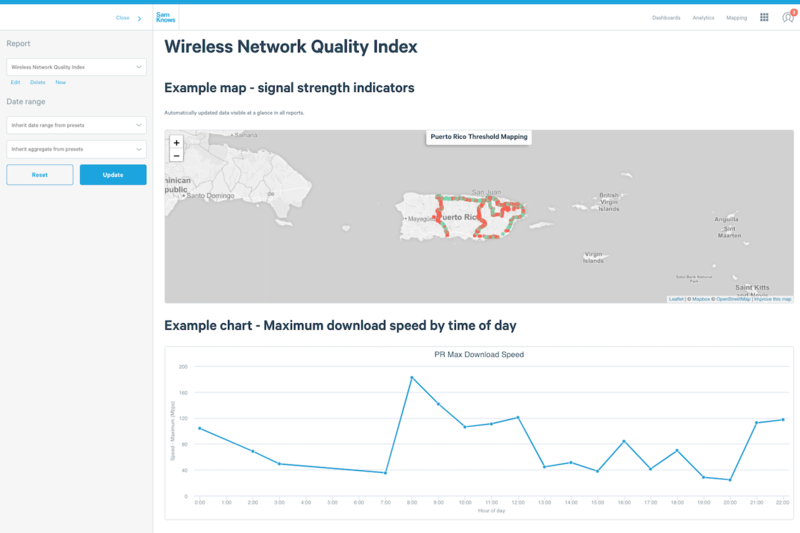 This product is based on the metrics set out in Annex 5 of the Voluntary Codes of Practice on Better Broadband Speeds to help you determine what your Normally Available, Maximum and Minimum speeds are and monitor them for any change. It fully supports xDSL and FTTP/Cable metric types and has Business and Consumer broadband variants. The metrics are fully integrated into SamKnows One allowing you to utilise the full power of SamKnows One analytics to use these metrics in alerting, dashboards, presets, data API exports or reports. We automatically perform actions such as prefiltering down to results that ran for the correct duration and with the appropriate thread count to meet VCOP guidelines on all metrics and we also perform aggregations of agent results before aggregating over the entire dataset with the Advanced Analytics product. We filter down to tests during quiet hour or hours then take the mean average of a measurement agents' results in the time bucket specified (e.g. a week), then we calculate the 80th percentile over those results. We filter down to tests during peak hours (8-10pm) then take a mean average of a measurement agents' results in the time bucket (e.g. a week) then we calculate the 80th percentile over those results. We filter down to tests during peak hours (8-10pm) then take a mean average of a measurement agents' results in the time bucket (e.g. a week) then we calculate the 20th percentile over those results. We filter down to tests during peak hours (8-10pm) then take a mean average of a measurement agents' results in the time bucket (e.g. a week) then we calculate a delta between that number and the measurement agents' sync-speed (defined in a metadata field) then return the average of these deltas. We filter down to tests during quiet hour or hours (currently 2am-6am for Virgin) then take a mean average of a measurement agents' results in the time bucket (e.g. a week) then we calculate a delta between that number and the measurement agents' sync-speed (defined in a metadata field) then return the average of these deltas. We apply that week's pre-derived national off-peak coefficient for the agent's current [at the time of the test] package to a measurement agents' results, then derive the mean average of those derived agent results in the time bucket specified (e.g. a month), then we calculate the 80th percentile over those results. We apply that week's pre-derived national residential peak coefficient for the agent's current [at the time of the test] package to a measurement agents' results, then derive the mean average of those derived agent results in the time bucket specified (e.g. a month), then we calculate the 80th percentile over those results. We apply that week's pre-derived national residential peak coefficient for the agent's current [at the time of the test] package to a measurement agents' results, then derive the mean average of those derived agent results in the time bucket specified (e.g. a month), then we calculate the 20th percentile over those results. We apply that week's pre-derived national residential peak coefficient for the agent's current [at the time of the test] package to a measurement agents' results, then derive the mean average of those derived agent results in the time bucket specified (e.g. a month), then we calculate the 10th percentile over those results. We filter down to tests during peak hours (12pm-2pm) then take a mean average of a measurement agents' results in the time bucket (e.g. a week) then we calculate the 20th percentile over those results. We filter down to tests during peak hours (12pm-2pm) then take a mean average of a measurement agents' results in the time bucket (e.g. a week) then we calculate the 80th percentile over those results. We apply that week's pre-derived national residential off-peak coefficient for the agent's current [at the time of the test] package to a measurement agents' results, then derive the mean average of those derived agent results in the time bucket specified (e.g. a month), then we calculate the 80th percentile over those results. We filter down to tests during peak hours (12pm-2pm) then take a mean average of a measurement agents' results in the time bucket (e.g. a week) then we calculate a delta between that number and the measurement agents' sync-speed (defined in a metadata field) then return the average of these deltas. We apply that week's pre-derived national residential off-peak coefficient for the agent's current [at the time of the test] package to a measurement agents' results, then derive the mean average of those derived agent results in the time bucket specified (e.g. a month), then we calculate the 20th percentile over those results. We apply that week's pre-derived national residential off-peak coefficient for the agent's current [at the time of the test] package to a measurement agents' results, then derive the mean average of those derived agent results in the time bucket specified (e.g. a month), then we calculate the 10th percentile over those results. The Australian Competition & Consumer Commission have published industry guidance on the advertising speeds of broadband. This introduces a standardised metric that characterises the typical busy period speeds for each broadband plan that an RSP offers ('RSP' is the common term for a retail internet service provider in Australia). 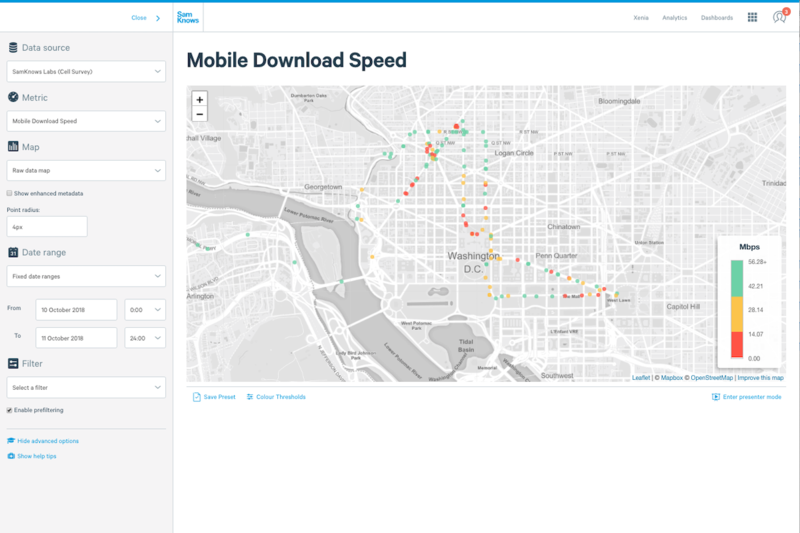 SamKnows has been extended to support the ACCC typical speed metrics natively. 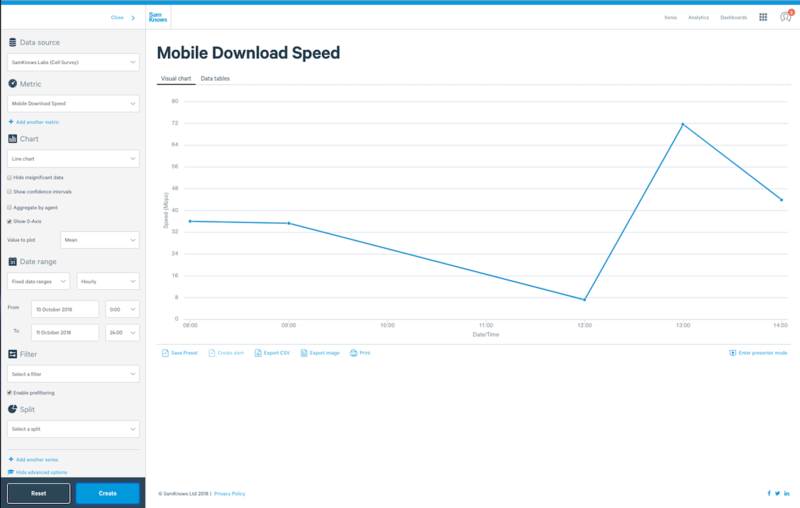 These allow you to visualise the typical busy period speeds, which are presented separately for download and upload speed. The metrics are fully integrated into SamKnows One, meaning that they can be used in data analysis, alerting, dashboards, presets, data API exports and reports. We calculate the metric in the same way we do for both the ACCC reports and in SamKnows One. The approach is described as follows. Average across all Agents, by day and hour. This should result in 56 records in total across a two week period. Pick the weeks + 1th lowest result. Across a two week period, this would mean picking the 3rd lowest result. This is the typical evening speed for the plan. The result can be presented in megabits per second, or alternatively as a percentage of the plan's advertised speeds. The FCC Mobility Fund II provides money for qualifying operators to invest in providing mobile broadband to unserved areas of the United States of America. In order to qualify it must be proven that the current available service is less than 5 megabits per second. SamKnows has built a kit, specifically for this purpose, which is now being used by the FCC. By federal and state regulators to monitor the impact on investment in areas where coverage is received. The Wireless Network Quality kit allows for the following active measurements to run. These tests measure the download HTTP throughput in bits per second. The test will run for a fixed duration (in addition to a TCP warmup period). This time is configurable at runtime. The duration default is 5 seconds, maximum is 30 seconds and minimum is 5 seconds. These tests measure the upload HTTP throughput in bits per second. The test will run for a fixed duration (in addition to a TCP warmup period). This time is configurable at runtime. This is a single test that provides three separate metrics upon completion: latency, jitter and packet loss. Only latency is shown in-app but all three metrics are submitted and visible in SamKnows One. You can configure the packet count, packet interval and test duration at runtime. The duration default is 5 seconds, maximum is 30 seconds and minimum is 5 seconds. The packet count default is 200, maximum is 500, and minimum is 100. Capturing the handset model ensures results are demonstrably compliant with the FCC’s list of accepted handsets for testing. 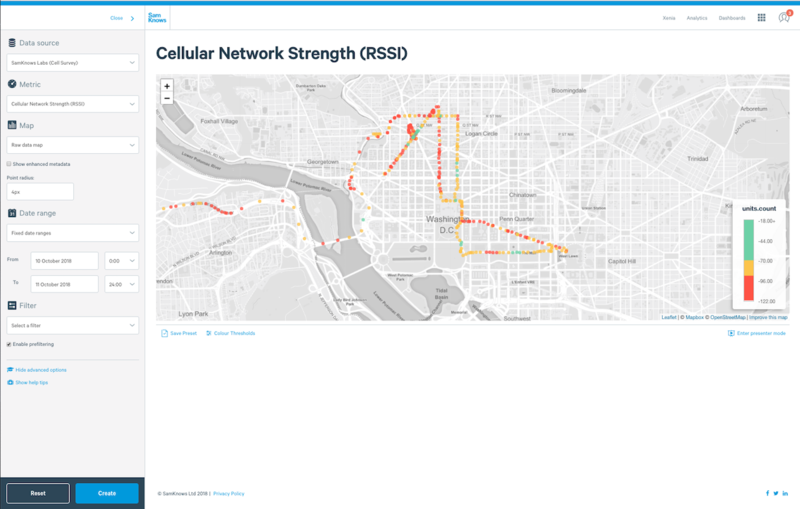 Demonstrating areas of low- or no-coverage by capturing tests that were not able to complete due to poor network proves eligibility across tested areas. 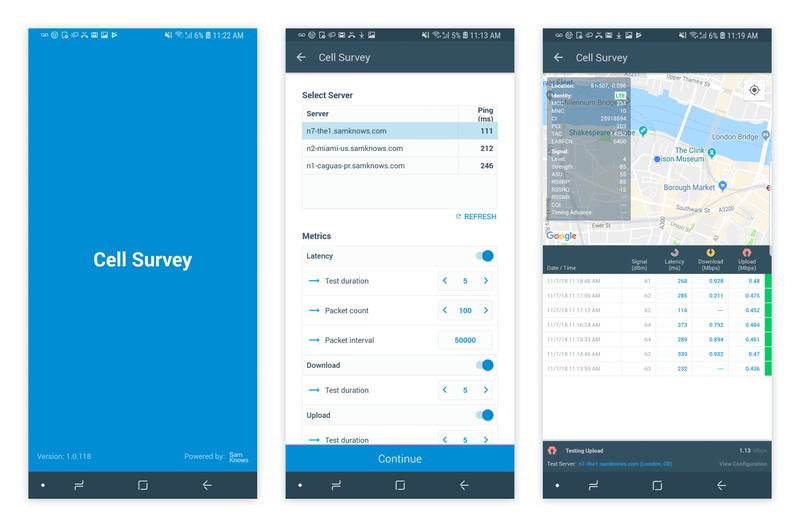 Data collected during drive or consumer testing is available in SamKnows One. As with all data in SamKnows One, it can be analysed in charts and mapping, or exported into raw .csv or .json files. Automated reports display data against thresholds required for regulatory and QA thresholds. This presents an at-a-glance view of metrics against predetermined standards, so it is easy to demonstrate where standards are met and exceeded or give guidance to areas that may need improvements. This can provide insight into where infrastructure is best deployed, and where service above specific thresholds is already being provided.